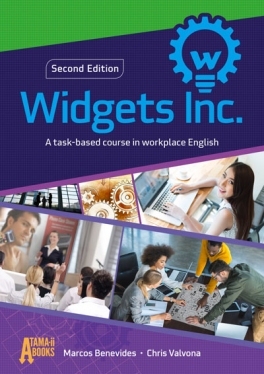 Widgets is a business-simulation course for English as a second/foreign language (ESL/EFL) classes, in which students imagine being interns working for a fictional company called Widgets. Widgets Inc. is designed to be compatible with a wide range of English proficiency levels (from CEFR A2 to C1), including mixed-level classes. It requires a class of 12 or more motivated adults who meet for between 20 and 100 hours. Students are placed into small groups and follow a task-based/project-based product development cycle in 6 stages. Stage 1 introduces the company and a cast of fictional characters who interact with the class via online streamed video. Stage 2 is an R&D stage in which students brainstorm product ideas. In Stage 3, they are given several product ideas proposed by a different team, and must select the best one to go into production. In Stage 4, they are given another team's selected product and must perform market research on it. Finally, in Stage 5 they prepare a proposed marketing campaign for yet another product passed from a different team. Stage 6 is the conclusion, in which students prepare a resume and interview for a promotion within the company. Each stage is punctuated by a main speaking and a main writing task which is related to that stage's topic. Tasks are sequentially connected, and increase in complexity as the students progress through the stages. For each stage, a different team member is selected to act as project manager for that stage. Students are assessed via can-do statements which are built into the simulation as "employee evaluations". These include self, peer, and instructor assessments. The course includes streamed video, which requires an internet connection to stream or for initial download. The video comprises about 15 clips which total to about 30 minutes. The video is not DRM protected, and is under a CC-BY-NC-ND license, which means that it may be copied and shared for non-commercial purposes without modification.